The Woodville Show took place on Saturday 17th September 2016. The organising committee was delighted to receive almost 100 entries. The show was officially opened by Woodville Parish Council Chairman Malc Gee. See attached for a list of show results and sponsors. The Inaugural Woodville Show will take place on Saturday 17th September 2016 at the Woodville Methodist Church Hall. This will hopefully become an annual show to showcase residents expertise in growing, making and cooking items in the annual schedule of classes. See attached for more details and list of classes. Ticknall Cricket Club in conjunction with Woodville Parish Council are bringing cricket back to the Woodville Cricket Ground for the 2016 season. We are looking for players and helpers to increase our player numbers at all levels of ability and off ground helpers to ensure this partnership will be suucessful. More in attached press release. A vacancy has arisen for the position of Parish Councillor. See attached for more information and details on how to apply. 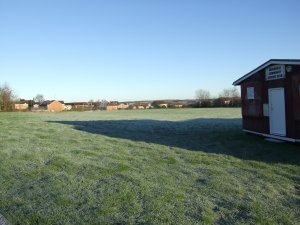 A two year scheme to improve a football pitch once rated as the worst pitch in South Derbyshire has been completed.